Valentine’s Day is almost upon us, folks; the holiday celebrating all things love-and-candy-hearts will be here in just a few short weeks. But you’ve probably been thinking about it for weeks already whether you wanted to or not. After all, pretty much right after Santa made his annual trip from the North Pole, stores started drowning in a sea of V-day pink and red. But the heart-centric holiday doesn’t have to be overwhelming — especially when it comes to clothes. There are plenty of cute, festive, but not too over-the top Valentine’s Day outfits your kid will want to wear year-round. Check out a few of our favorites ahead. This adorable, heart-covered onesie and red cardigan are perfect for Valentine’s Day but can be worn all season because, let’s be real, babies are the real loves of our lives. 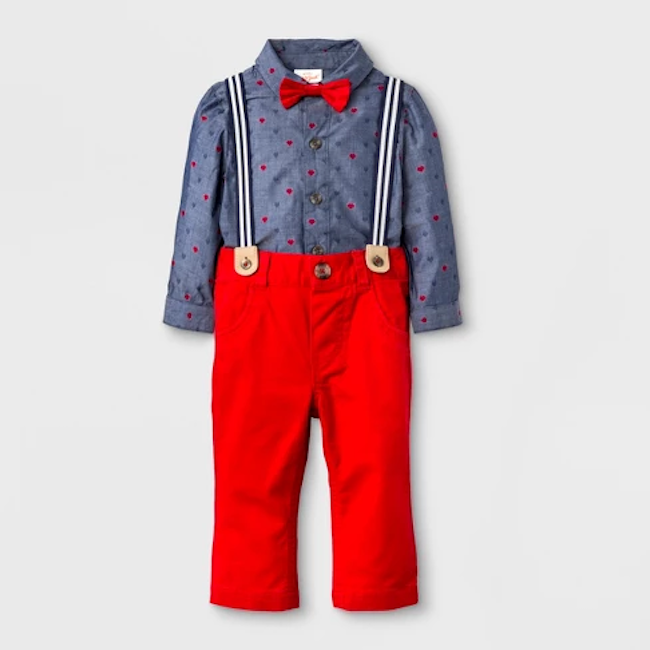 This snazzy outfit is dressy, dapper, stylish and sleek — not to mention the bow tie is too cute for words. Perfect for your little man! While many think pink is Cupid’s color, this pastel shade is perfect for the spring and Easter season. Disney characters are timeless, and the same is true of this dress. With a red tulle skirt and white hearts, this number is sure to make any Minnie fan smile. Be still my Star Wars-loving heart! This adorable shirt is perfect for the little Rebel in your life. With a pink bodice, oversize bow and red tulle skirt, this dress is perfect for the little princess in your life.